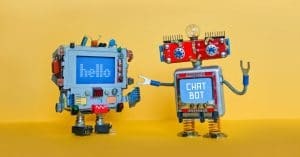 The power of Facebook messenger bots in a brand’s marketing arsenal is valuable for connecting with customers and driving sales, but is often overlooked. Think about this – you hop onto an unfamiliar brand Facebook page. You are seeking information about a product you may be interested in purchasing, but you just don’t see what you are looking for in front of your face. You are about to hop off the page and say forget it, when all of a sudden, a friendly chatbot pops up in the bottom right hand corner of your screen. “Hi – Welcome to our community! If you need help or have any questions, reply to this message.” As if they read your mind. You stick around, message the bot, get the information you need and then you purchase the product after all. Chatbots for business are beneficial and useful tools you should have in your Facebook marketing game plan. Facebook messenger bots offer the ability to automatically engage your customers on Facebook — answering any questions and clearing up any concerns — thus, increasing your sales by influencing potential customers to actually convert. Automation is queen in business and chatbots for business eliminate the need for extra employees, and save lots of of time and funds. Plus, if bots help increase your sales then it’s a win-win situation. Facebook released data about the effectiveness of businesses using chatbots in case you need further convincing. Fifty-three percent (53%) of people are more likely to shop with a business they can message directly. And 56% of people prefer messaging over calling customer service. We all know calling customer service and being put on hold forever is the worst. Simply messaging a bot and receiving an almost instant response reassures the customer you care about their satisfaction and you value their time and their business. As with every type of marketing tactic, in order to see positive results, you need to go about using chatbots for business the proper way. Some brands have mastered the art of Facebook messenger bots. Here are some of the ways we recommend using a chatbot messenger to connect with your customers on Facebook. Whether consumers are searching for a specific product, inquiring about shipping to a location or some other issue, a chatbot’s job is to guide consumers to always find the answer. Think through any and all questions your consumers may ask and personalize the chatbot to ask and answer flawlessly. Even though the chatbot is well…a bot, the tool shouldn’t act like one! You want your messenger bot to show personality — give the bot life! Customer service should be helpful, as well as friendly, fun and a positive experience. Match the bot’s tone to your brand’s voice attributes — truly crafting the voice and personality to perfection. Don’t be afraid to use emojis or gifs in your responses if appropriate. People shop at all hours of the day, therefore, your business should be able to respond at nearly all hours of the day. Facebook messenger bots should always be on and ready to answer any and all questions and concerns. You may not get the chatbots tool right the first time…or even the second time for that matter. Your customers may ask questions you didn’t think of at first. Customers may still not convert for some reason. Your job is to evaluate their journey and experience with your Facebook messenger bots and your Facebook pages as a whole – then adjust accordingly. Constant improvement is key. 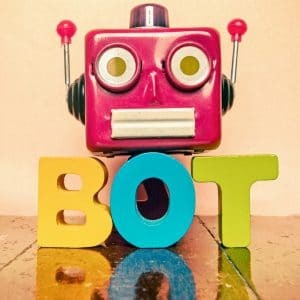 Is your business is thinking about using Facebook messenger bots to connect with customers? Comment below with some of your fears or concerns using chatbots for business.